When I picture an outdoor space in my mind, it looks very much like an indoor space. I try to use the same tricks for outdoor decor that I use for inside my home. Decorating for the seasons should be no different. 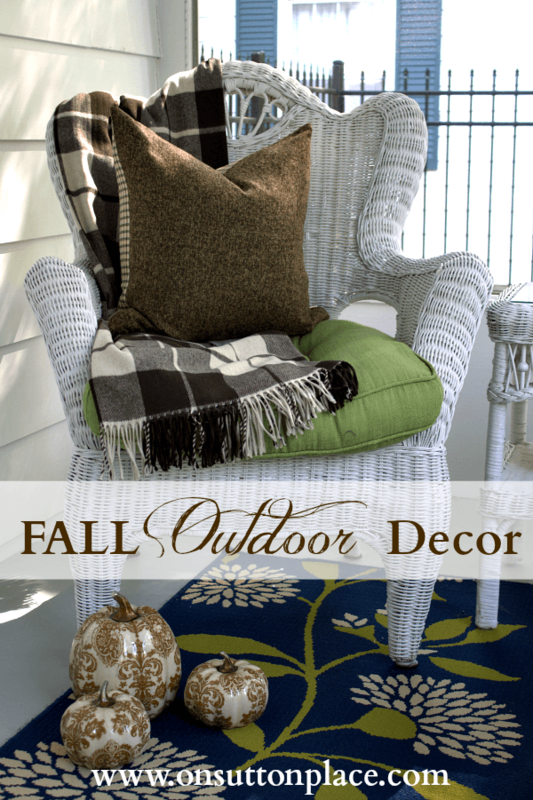 Fall outdoor decor should be pretty much the same as what you use inside your home. 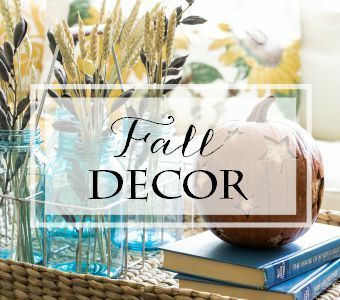 You can add soft furnishings in autumnal colors and decorative accessories to make your outdoor spaces cozy. That’s exactly what I did to bring a touch of fall to my back porch. I actually enjoy using this space more in the fall than spring or summer. A slight chill in the air and the smell of leaves makes it a perfect place to hang out. The spot beside the wicker sofa always looks so empty so I brought out my lanterns and added the little bee skep. When the weather turns even colder I can bring them in the house and brighten up some spot inside. Hopefully the pumpkin gourds will last long enough. With all the blue and green already present, I thought orange might be a bit on the flashy side. I opted for brown because I think of it as a neutral. I added brown ticking pillow covers, some animal print and linen. Cozy plaid throws and brown flannel finish things off. I didn’t want to go overboard with pumpkins sitting all around since soon it will be too cold to use the porch…so I dug through my bins and found these toile pumpkins I got last year. The other pumpkin is sort of a good idea gone bad. I wanted to mod podge real leaves but it was way harder than I expected. I had dried the leaves between wax paper under books so they were too stiff to stick to the curvy pumpkin. It took forever and many coats of mod podge to get the leaves to stay put. I’m not sure what I could have done differently…and I’m not planning to try again any time soon! Here is a pic of my two mod podge creations. 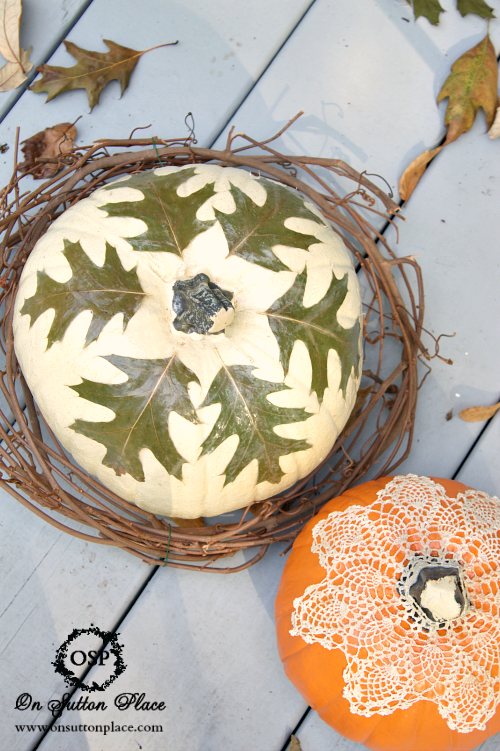 Click HERE for the lace pumpkin tutorial…it turned out much better than the leaf one. Maybe I should have left well enough alone! I didn’t get much bittersweet this year but what I was able to cut was beautiful. 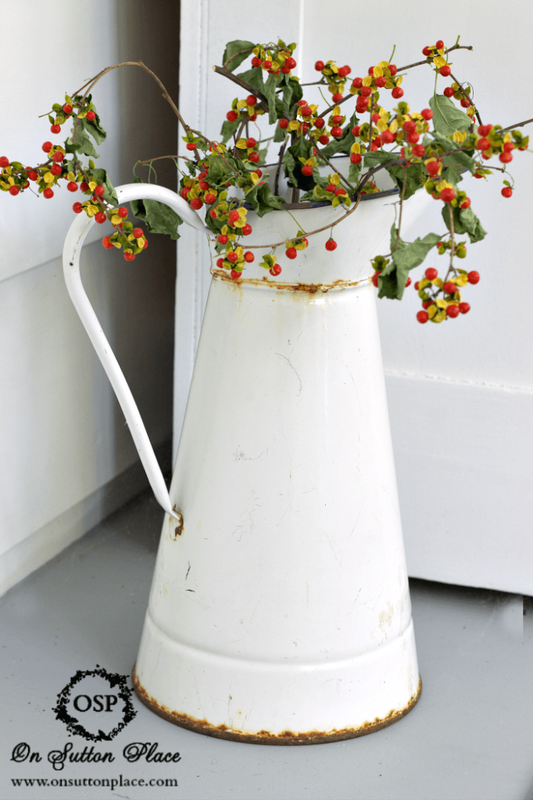 I wound some around my ivy topiaries and the rest went in this enamelware pitcher. I have a few more spots I want to add some fall touches to and then I’m going to call it a day. Next up is my kitchen…just a few little tweaks. I’m really the only one who spends time in there so I kept things simple. I love the lace on the pumpkin…so unexpected. Love! I Love the ideas. I like the Leaf pumpkin as much as the Lace pumpkin. 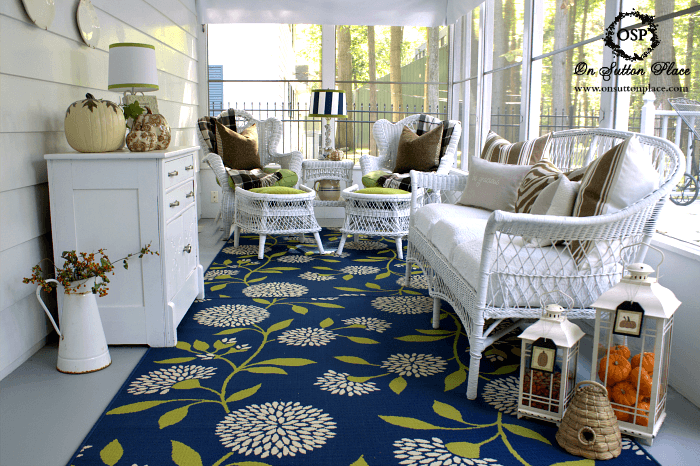 Your back porch looks lovely, cozy, friendly and inviting. Ann, your porch is so warm and inviting. I love the addition of brown. I have two lovely white wicker chairs in my living room, that I want to replace sometime, so they can become outdoor chairs. Do you mind telling where you got the beautiful rug on your porch?? Ann, I love how you brought brown onto your porch! You would find me wrapped in one of those throws and sipping a hot toddy if that was my porch! The pumpkin with the leaves may have been a pain to make but it sure is pretty! Since all our leaves are still green, I would have to resort to using artificial ones! Your porch looks lovely. Your rug has mums on it so it fits with the fall decorations and going with brown was just the right touch. I think the leaf pumpkin looks great, although I didn’t realize the leaves were green. They look brown in the first picture. I could see using real leaves as a tracer and then just filling in the space with brown or gold or orange paint. I’m kind of inspired to give it a try. Somehow I’ve lost my entire box of fall decorations and was only able to find two glass and porcelain pumpkins that don’t fit in the box. Weird,eh? How does one lose something like that? Ann, your porch looks so inviting. I’ll be right over. I too would have never thought of apple green and brown for fall but when you think about it those two colors are all over the place in the early fall. And they look terrific together. I love the little tags on your lanterns. Did you make them? A tutorial perhaps??? The porch looks great and I LOVE the brown ticking pillows! Hi Ann, hope all is well. As usual you did an outstanding job. Love all the touches of brown. 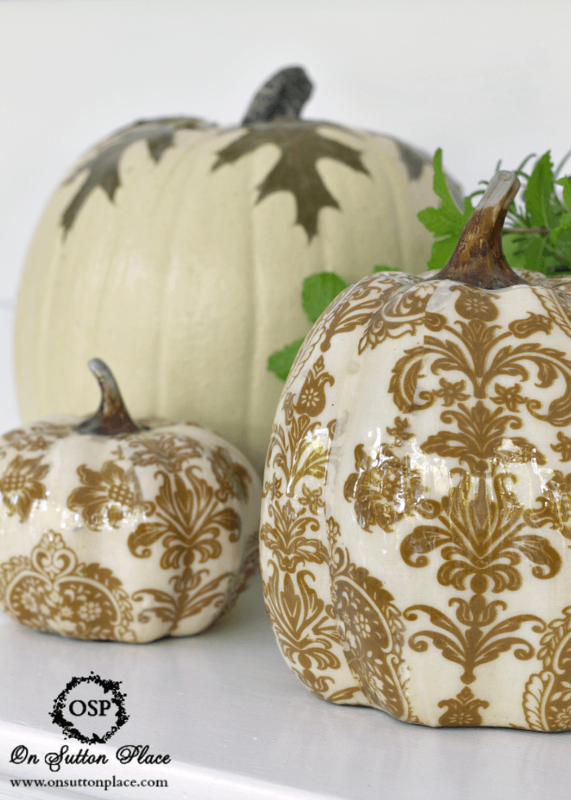 Those toile pumpkins are so pretty and I think the one with leaves is very pretty. What a lovely fall porch. I really like the touches of warm brown and your lanterns look great filled with pumpkins and gourds. 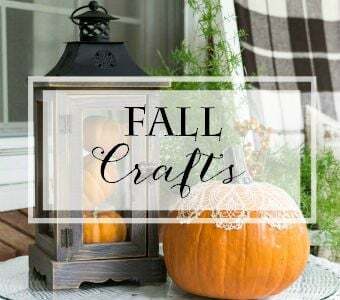 Ann…I so love your porch in all seasons..and I must say that I am loving the colors that you have chosen…just so beautiful….you always give me so many great ideas to embellish items for the season…just love the leaves and lace on the pumpkins!…Such a warm and cozy space! Ann, what a lovely, cozy space to enjoy a delightful fall day! I would never want to leave. I love your color choices and your pumpkins are beautiful! So lovely! 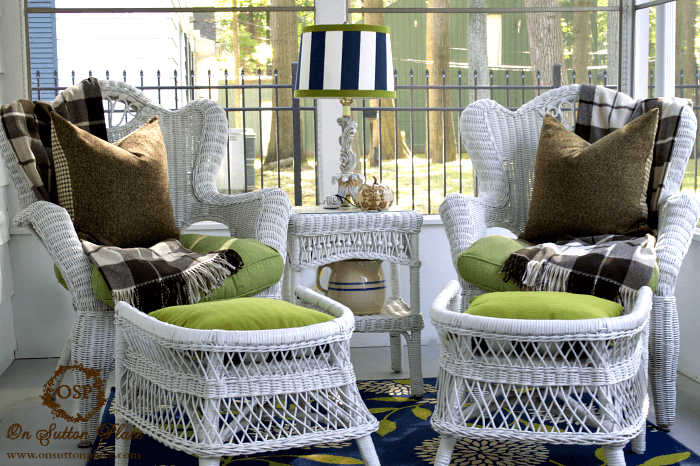 I adore your wicker seating group- the greens with the browns and whites- gorgeous!! love chartruese and brown together! 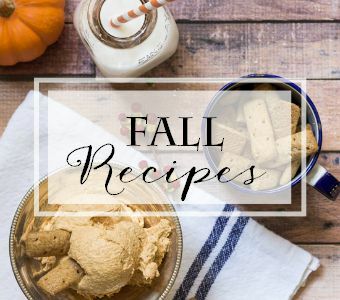 a favorite but never thought of it for fall which is amazing. my suggestion for the mod podge leaves is to use paper cheese leaves. may be available through williams sonoma. i love the zebra pillow and am looking for that fabric but in a light blue colorway. would you know where i might find it? Oh ann — I just adore your style! So classy and beautiful!! Did you design all the little wreaths and sketches for your site — they are BEYOND darling! Your back porch is BEAUTIFUL!!! Your decorating style is absolutely impeccable! Your porch is so warm and inviting, yet so crisp and cool looking. I need to go back and pin. I love an outdoor room that feels like the indoors. The perfect place to have an apple cider – gorgeous! I love your Fall porch, Ann. Absolutely beautiful! I especially like the bittersweet in the enamel pitcher . Great vignette and shot! Absolutely beautiful Ann!! 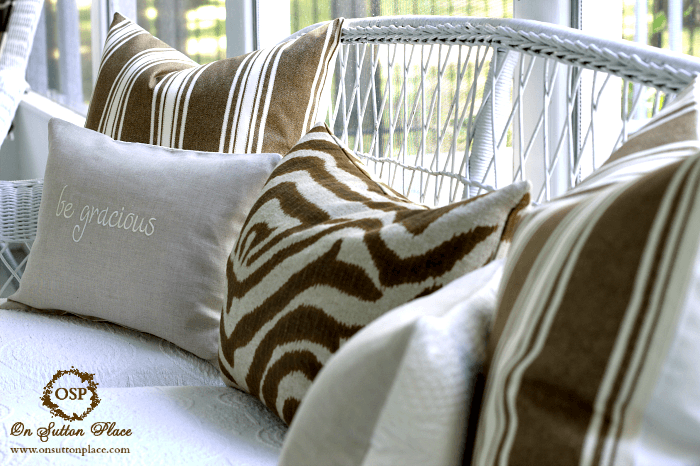 I love the touches of brown…love love love your pillows! I love the touches of brown with your green and navy. Your porch looks so pretty, Ann! I noticed your putka pods and must get mine out. I forgot about them this year. Have a great day! I love your plaid throws! Can you share where you got them? I was also thinking if you would have used freshly picked leaves for the mod podge that might have been easier, because they are soft and flexible, and the glue would have preserved them (maybe). Your porch is 2die4!!!! I love everything about it and those brown pillows are gorgeous. Happy Fall sweet lady. Gorgeous, just gorgeous Ann! Your pumpkins are darling. I love the throw you have, it looks so cozy! Hi Ann. What a lovely space. Great choice of colors in the room. 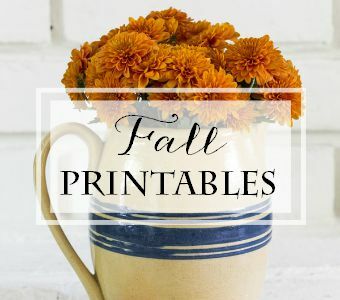 You know I have tried two mod podge projects – one was an epic failure and the other ( which I will be posting about this week) was a close second. You are not alone! Have a great day and Happy Fall!! Beautifully done, Ann and it is so nice and cozy and calls me out there to wrap up with a throw and sip some cider. Your Fall porch is gorgeous, Ann! I love the pops of brown and white (especially your lush throws) against your beautiful blues and greens. I remember your fabulous toile pumpkins, and I think your mod podge leaf pumpkin turned out great!